How to get there: Billingen is a good point to start from. Billingen is located on Hwy. 15, between Stryn and Otta. Coming from Stryn (or Geiranger), Billingen is about 12 km after Grotli in the direction towards Otta. Driving time from Bergen is about 6 hours. In the opposite direction, approximately 33 km after Sjåk. Driving time from Oslo is probabely about 5 hours. There is a trailhead with a DNT sign for the trail that runs up the valley Torddalen, parking for 4-5 cars in the winter. The elevation is 732 meter and the precise location, north 62:00.589, east 007:51.699. Route description: See the description of Ø. Gråhøe for the initial part of this route. From Gråhøe, descend north towards the glacier Storebreen. Climb this glacier (a very gradual climb) and cross towards Digerkampen located just north of the glacier. Leave the glacier and ski down into the saddle that separates Digerkampen from Storebreen, then climb the south slope of the mountain. Comments: I did this climb with my son Pål Jørgen, age 14. 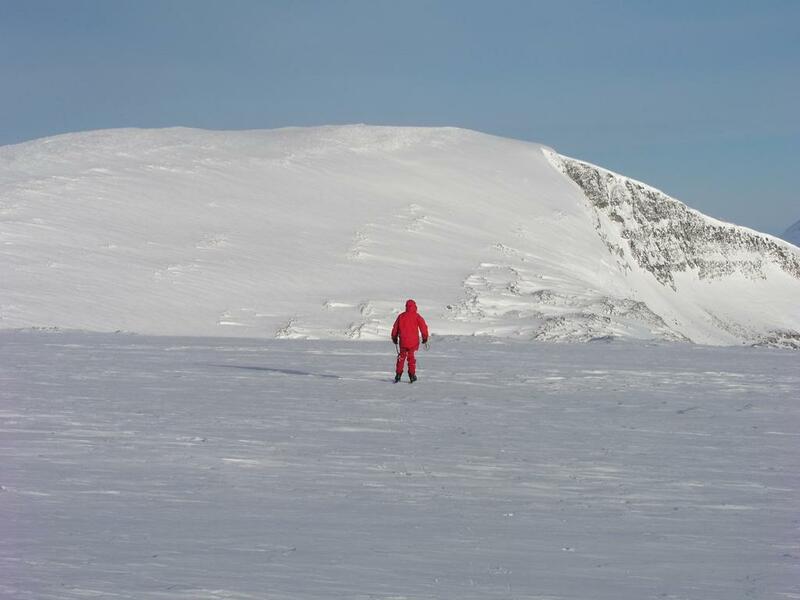 A brief trip report can be found under comments for the climb of Ø. Gråhøe, 2014 meter. Skiing on Storebreen on the way to Digerkampen. View from Digerkampen, the direction is north to north-east.